(*) Currently, TV Friends does not support Arabian language. This means that users must agree English End User License Agreement. In addition, Arabian texts including Twitter comments won’t be displayed properly in TV Friends. (*) If you select a language which is not English or a public language of a certain country, the country won’t be displayed on the Country Selection Screen. The language selection screen is shown when you first boot “TV Friends.” You can also change the language from “Settings” menu. A problem that HTML element characters like “<” are not displayed properly in chat texts is fixed. A problem that there is a case that you cannot input a handle name properly is fixed. A problem that there is a case that the client may crush when you finish TV Friends on the Avatar Selection Screen. A problem that the client crushes when a user input an empty text on the Chat Text Input Screen. A problem that the client crushes when a user select a room where there is less amount of available memory. A problem that a Client Version Error may be displayed when a user enters a room where there is less amount of available memory. From 2014/07/24 10:00 (JST) for 4 hours, a maintenance will be held. Tnak you for your understanding. Version Up Info will be announced later. Enjoy the World Cup with TV Friends! 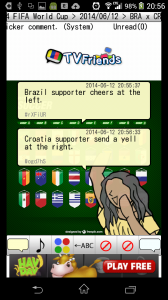 TV Friends now have chat rooms for “ALL” World Cup’s matches! A special featured page for explaining how to use TV Friends watching the World Cup is released! Please enjoy. This event has been finished. Before the version 2.3, the application starts showing stacked comments immediately to ctach up to the current time when more than 50 comments are stacked. From the version 2.3, the application do the same when the number becomes 30. A process for loading Twitter comment icon bacome lighter to reduce the possibility of crashing the client when there are too many Twitter comments. Until today, “#CountryName #CountryName” is used for the World Cup related chat rooms, but it is difficult to avoid the client’s crash because of lack of memory when there are too many Twitter comments in a very short time (especially, in English mode). Therefore, a new hash tag, “#CountryName #CountryName #WorldCup,” is used to reduce the World Cup related comments effectively. A problem that the client on Android 3.0 or less version may crash when the application is paused on a list (like the Coutry/Region List or the TV Station List) and resumed is fixed. A problem that your comment (like a chat comment or a Sound Effect) takes long time to be displayed is fixed. A problem that a room entrance comment takes long time to be displayed is fixed. From 2014/07/12 19:00 (JST) for 2 hours, a maintenance will be held. Tnak you for your understanding. To wait for synchronization of Google Play, the maintenance needs 1 more hour. Still waiting for the synchronization. The maintenance needs 1 more hour. Chat rooms for finished World Cup matches are now disabled and won’t be displayed. Increased frequency of withdrawing Twitter comments. By doing this, computing load will be decreased. From 2014/07/04 16:00 (JST) for 2 hours, a maintenance will be held. Tnak you for your understanding. Copyright© LUXALA Inc. All Rights Reserved.